Python is an interpreted, object-oriented programming language. Uses an elegant syntax, making the programs you write easier to read. Python supports object-oriented programming with classes and multiple inheritance. Do you want to make solid career in python development as a professional ? There is INCREASING NUMBER of python jobs in India for freshers and across top countries in the world. Agile academy provides one of the best python course with quality python programming training along with placement support. 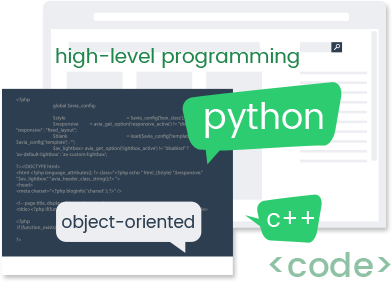 Python is an Object Oriented Programming Language that allows you to work more rapidly as well as combine your systems more proficiently. It supports various programming features and prototypes. A standard library contained by Python is huge and wide ranging. Python development is a sophisticated language that emphasizes readability of code. Learn programming in Python by taking advanced Python training from Agile Academy. Python is a powerful language used by big websites such as YouTube and DropBox. Agile Academyâ€™s intensive Python training courses are customized for the individuals who would like to learn how to use Python in their particular working environment. Mentors at Agile Academy are fully experienced that they are able to bring the real world to the classroom every day. Alike other software courses, there are few available python training in Ahmedabad because of lack of exposure to this technology but it is as mainstream programming language as java or asp.net. You should ask for frameworks – Flask or Django and other components like tornado, Tkinter…etc that will be covered before selecting course, Agile academy claims to be one the best python training in Ahmedabad because of covering both frameworks or whichever students wish and many other above mentioned components. If you want to learn all the nitty-gritty concepts of Python to develop your own application, Agile Academy is a place where you get all the knowledge. Agile academy offers the best python course content covering comprehensive number of topics and is one of recognized python training in Ahmedabad. Agile Academy is an IT Professional Training and Live IT Project training Center that serves IT student and fresher with 100% Placement Guarantee. We provide placement opportunities to all the Students in our own Group of Company - Agile Infoways Pvt. Ltd. & also in other well known IT companies.